The key to being a good [tag]defensive[/tag] [tag]basketball[/tag] player is quickness. When playing [tag]defense[/tag] your players need to be able to cut off the opposing team’s offensive, and stay quick on their feet in order to block the shot and passing lanes. The following basketball defensive drills will increase your players’ quickness which in turn will aid their defensive skills. Of all the [tag]basketball defensive drills[/tag], I like to start with jumping rope. Make sure to start your players off slowly by jumping at a leisurely pace for approximately 1 minute before launching into the full speed jumping. Try having your players jump for 30 seconds on one foot then 30 seconds on the other, then 30 more seconds at full speed with both. Repeat this series 3 times. The next of the basketball defensive drills that I run at my practices is a defensive [tag]slide drill[/tag]. 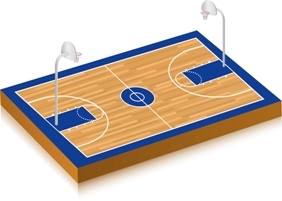 For this [tag]drill[/tag], have your defensive players start at one corner of the court and have them slide on their right side for half the court and slide on their left for the other half. Repeat this series 2 times before adding in an opponent with a ball. Repeat the drill for 2 more lengths of the court with the defensive player attempting to either take the ball from the offensive player or at least keep the offensive player blocked at all times. The last drill I like to do to keep my defensive basketball players quick and agile is a series of running [tag]sprints[/tag]. While the players may dislike sprints, they are the best way to get players running fast and demonstrating good hustle, both of which are key components of a successful defense.